This game is played in three stages. Do each stage until enough of the players are comfortable with the names of the others in the group. 1. Form a circle with the group. Say your name and throw the pillow to another person. 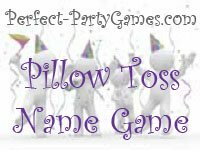 That person will say his/her name and quickly throw the pillow to someone else, etc. Do this long enough so that everyone has said their name several times. 2. While holding the pillow, say someone else’s name and throw it to that person. Do this long enough for each person to receive the pillow several times. 3. While holding the pillow, name the person you are going to throw it to, and the person for him/her to throw it to. For example, “Rick, throw it to Sally.” When Rick catches the pillow, he will say, “Sally, throw it to Jack,” etc. 4. Have someone name everyone in the group. Participants say their names and favorite person, place, or thing. After this has gone full circle, find out who can name everyone.